· With headless mode, it is not necessary to adjust the position of the aircraft before flying. · With tracking function, remote control for aircraft followers, arbitrary and simple handling. Default telemetry and mission planner. 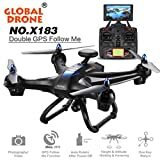 · Functions: GPS fixed point and high setting, headless mode, real-time data transmission, one key return, WiFi FPS, photography, video, forward/backward, side flight, turn left/right, up/down, with light.